This book had been on my radar for a couple of months before I finally received it as a Christmas present this past December. 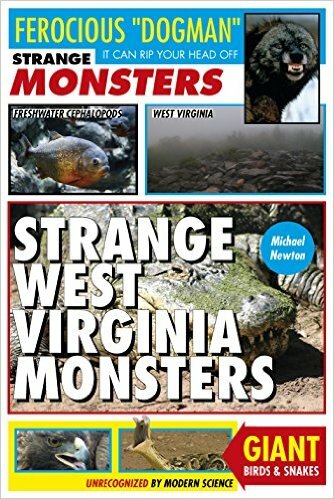 Even though I already owned quite a collection of books dealing with all the strange critters of West Virginia (plus, dozens other on West Virginia ghosts & hauntings, UFOlogy, etc, lol) I was really excited to see how this author would put his own spin on the topic...and what cases would be covered. Before I even get into the content of this book, though, I have to comment on its appearance. This is a REALLY awesome book, visually. As you can tell from the cover photo, it's set up like a tabloid newspaper. Bright colors, bold text, and full color photographs and illustrations not only grace the cover, but are found throughout the book as well. 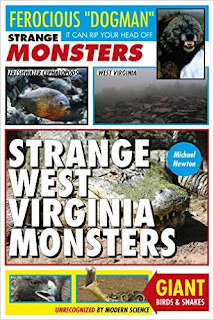 Broader chapter headings are further broken down into individualized case studies, and the creatures featured range from your more mundane Bigfoots to the REALLY weird and uniquely West Virginia monsters, such as the Braxton County Monster and Sheepsquatch. It was those chapters on the more unique monsters that really interested me the most. Although I was familiar with the vast majority of the material covered in the book, most of it being stuff I've read in other books, message boards, blogs, and websites, it was really cool to see it all compiled in one place. As an added bonus, the more outrageous and unique animals had pretty short write-ups---interesting and to the point---which served my ADHD well. What I had a little trouble getting through were the chapters on more common sightings, such as the Bigfoot and out of place felines. Since this book focused mainly on reporting sightings and didn't really include much generalized information on these monsters, it led sometimes to huge blocks of text with nothing more than a list of sightings, one after another. Therefore, while reading, I did a lot of skipping around chapters, trying to balance out the short and easy to read, with the more tedious. In future editions, it might be a little easier if bullet points were used in some places, but overall, the effect wasn't bad and really shouldn't bother most people too much. I'm just sort of a...distracted...reader at times, lol. Overall, I highly recommend this book. It's a great compilation of a very weird side of West Virginian history and culture. There's a good mix between historical and modern sightings, great photos and illustrations, and a very thorough works cited section. It deserves a place of honor on the shelf of any West Virginia para-enthusiast! Theresa's Back on the Radio!